The 42,500-acre Mattamuskeet Drainage District (approximately 64 square miles) in Hyde County is one of the largest drainage districts in North Carolina. It has been the focus of wetland and hydrologic restoration efforts for the federation since 2003. A series of projects has been designed and implemented with the primary goal of restoring hydrology and habitat on ditched and drained farmland. By recreating historic flow patterns and habitats the degraded water quality in downstream estuaries can be improved. The re-created wetlands retain, filter and provide natural treatment of agricultural runoff from remaining upstream farms. They are also effective at restoring watershed hydrology, trapping sediments, converting nutrients and preventing other pollutants from reaching the downstream coastal waters. Nearly 2,000 acres of farmland have been restored by the federation and its partners. Funding for an additional 1,400 acres has been secured and work is proceeding. At this stage, the goal–restoration of pre-ditching-and-draining flows–is in sight. It will take some more time, but it’s happening. Right now. The land within the association was historically forested wetland but in the 1930s was accessed for forestry operations; harvesting large juniper and cypress. In the late 1960s and 1970s the land was intensively ditched and drained to further facilitate forestry and convert the rich organic soils to farming operations. The network of ditches and drains severely altered the natural hydrology of the landscape; speeding the rate at which water moved from the land to surrounding coastal water bodies, and altering the direction and volume of water flow. In addition, by the late ’70s the association began using large capacity pumps to further manage water within the association. These pumps discharge drainage water into the surrounding coastal water bodies: the Pamlico Sound, the Intracoastal Waterway and the Alligator River. The effect of the altered hydrology and conversion of habitats on water quality has been a point of focus for association’s landowners, the federation, researchers and their partners since 2003. This group has worked to develop a comprehensive plan for the association which restores degraded wetlands and historic water flows to improve water quality while maintaining the use and enjoyment of the land. Since the early 1990s landowners within the association have worked with the Natural Resources Conservation Service (NRCS) to identify lower lying, less productive lands that can be enrolled in the Wetland Reserve Program (WRP). WRP places a permanent conservation easement on the land and restores it to basic wetland function. By 2012 the association had enrolled nearly half of their land in the WRP program, making it available for wetland restoration. 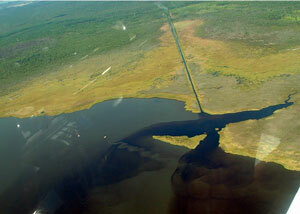 The federation spearheaded wetland restoration efforts within the drainage district in a phased approach. A comprehensive plan for the drainage association was developed in 2012 which identified at least 12 potential projects. The goal of these projects is to keep water within the association in order to minimize the need for pumping to coastal waters, while improving habitat, water management and water quality. 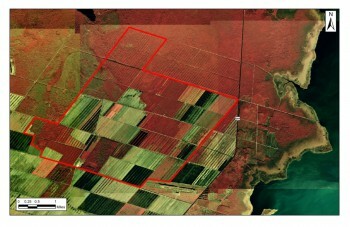 An infrared photograph of the eastern portion of the drainage association, outlined in red. Land showing up as red indicates lower elevation, wetter land, this information coupled with LIDAR data and ground truth survey work indicate a historic slough flowing to the northwest. Identification of natural features such as these was key to developing the restoration design for many projects identified within the association. Restoration techniques: One pump station was installed to lift water into the restored area. Water levels are managed to improve water quality and facilitate establishment of Atlantic White Cedars and other bottomland hardwood trees. Acres restored: 600-acres of wetlands enhanced to create habitat for migrating shorebird, water quality benefits, and improved water management. 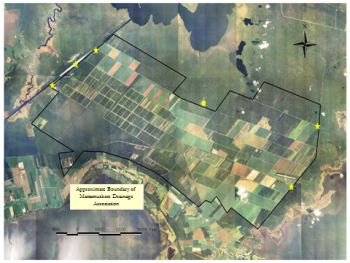 Caption: Conceptual design of wetland restoration for shorebird habitat improvements. Acres to be restored: 1,400-acres of forested wetlands enhanced to restore historic hydrology. 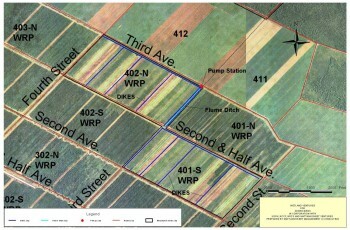 Caption: Restoration design for wetland enhancement project L1 within the drainage association. Restoration technique: Two pump stations are designed to lift water into the 1,400-acre block. Cypress sloughs, berms, baffles and water control structures are used to manage water levels as prescribed by a water management plan. Water levels are managed to restore hydrology and improve habitat, water quality and water management capabilities.